As a poultry owner, you know how important it is to keep your birds healthy. By practicing biosecurity, you can help reduce the chances of your birds being exposed to animal diseases such as avian influenza (AI) or exotic Newcastle disease (END). "Biosecurity" may not be a common household word. But, for poultry and bird owners it can spell the difference between health and disease. 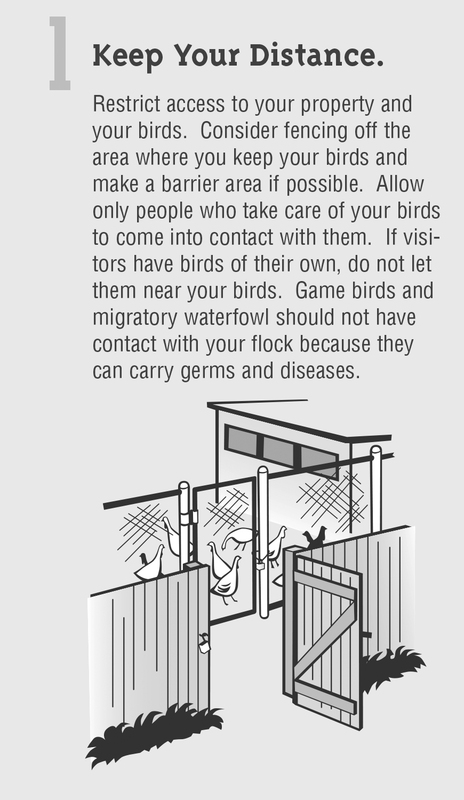 Practicing biosecurity can help keep disease away from your farm, and keep your birds healthy. Making biosecurity a part of your daily routine while caring for your birds can decrease the chance of END or AI showing up on your doorstep. Information sourced from the USDA. For a full brochure on biosecurity, read the United States Department of Agriculture's online PDF (here). Keep calm and try these calming treats for anxious pups. The summer months are known to be when natural disasters hit here in Florida. Are you prepared for a hurricane or tornado for not just yourself, but also your pet. Plan in advance if you live in an evacuation area (Manatee county residents check here). Write down your plan or create a checklist. Share this information with a friend / family member or have a back up plan that includes a friend / family member outside of an evacuation zone. Remember to take your pet with you when you evacuate. Know your evacuation route (Manatee county residents check route here). Make sure you have proper identification and up-to-date immunization + rabies vaccination records for your pet (copied and placed in a protective sleeve to avoid water damage is advised). Make sure you have a collar and leash for keeping your pet under control. Keep a separate carrier for each pet that they can sit and turn around in, the carrier should also be labeled with identification (taping the aforementioned identification in a protective sleeve to the crate keeps everything in one place). Pack supplies for your pet including vet records, a two week supply of food and water, medications with instructions, bowls (consider these collapsible types), toy and blanket, cat litter/pan, plastic bags, collar/leash, disinfectants for pet washes, and a current photo of your pet (printed, not on your phone). if you must use a kennel, make sure it is not in an evacuation zone (River Landings Animal Clinic is not in an evacuation zone). A kennel option is only possible if you have proof of vaccinations. If possible, reserve a spot in advance. Walk pets on a leash until they become re-oriented with their new home and surroundings. Often familiar places and landmarks may be altered from the weather and pets could easily become lost or confused. Reptiles may be out and about brought in by flood water and debris. Be aware of the threat they are to you and your pet. Bring along a picture of your pet for identification. After a disaster, animals may have a shift in behavior such as aggression or defensiveness. Monitor any changes. Don't forget to subscribe to our email newsletter for more recipes, articles, and clinic updates delivered to your inbox (here). Or, you can keep up to date by liking and following our Facebook page (here). We hope you've met her. Maybe you've seen her sleeping on a chair in the lobby or waiting with hopeful eyes by the water cooler. There's a chance she has stepped on the scale with your pet at weigh in and a strong possibility that she has investigated the contents of your purse or wallet when you tried to pay your bill. "She" is Isabella, our resident tabby cat, whom we call "Bella" for short. Dr. Fox adopted Bella from an organization called "Alley Cat Rescue" back in 2005. She is approaching her thirteenth birthday and is in good health but for some allergies that require medication. Alley Cat Rescue is now called "Gulf Shore Animal League" and they work tirelessly at their "Trap and Release" program, which catches feral cats to be altered and then released in an attempt to help control cat overpopulation. Over the years, Dr. Fox has worked closely with Gulf Shore, altering hundreds of cats and treating many more various health issues. Our Bella loves to lick the plastic bag lining the garbage can. She likes to lie down on the appointment book when we need it and pull lollipops out of the candy basket and drop them on the counter when she feels like it. She offers no apology for these infractions and we allow them because of what she does offer. She is the welcoming friend in the lobby while you're waiting. She's the demanding but sweet inspector at checkout. She is comfort when a loss occurs and she is our one and only Bella; the feline member of our family. We hope you've met her.